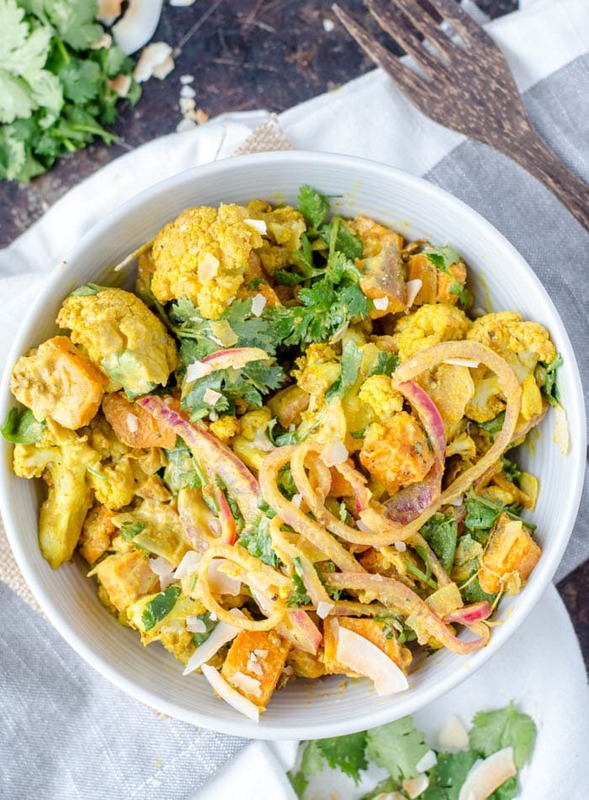 This vegan curried roasted cauliflower salad with sweet potato, pickled onion, coconut and sweet curry dressing makes for an interesting combination of flavours that you will love. I love making quick pickled onions for food prep so I can add that tangy flavour to meals all week long. They’re really easy to make and you can add them to everything from sandwiches to salads for extra flavour and nutrition. There’s a few different ways you can make them but most methods will call for the same ingredients: salt, vinegar and sugar. If desired, you can also add flavour enhancers like garlic, peppercorns and mustard seeds. Slice a red onion into rings and place in a bowl. Pour boiling water over them, enough to cover, and let sit for 10 minutes. Drain. Add 1/3 cup of white wine vinegar, 1/2 tsp sugar, 1/2 tsp salt and 3 cloves of garlic to a mason jar. Add the onions to the jar and place in the fridge. They’ll be ready to eat in about 30 minutes and can be refrigerated for up to 1 week. There are few different options for making the creamy curry dressing for this salad. I used soft tofu to make mine but you could also used soaked raw cashews or unsweetened dairy-free yogurt. Once you choose a base, you’ll blend it with curry powder, lemon or apple cider vinegar, garlic, dates and sea salt. If you don’t want to use dates, you could try sweetening it with pure maple syrup, coconut sugar or liquid stevia. If you’d like to use cashew or yogurt in place of tofu, use about 3/4 cup plain and unsweetened non-dairy yogurt or about 2/3 cup raw soaked (soak for at least 3 hours) cashews blended with a bit of water to make thick cashew cream. This salad is far from a boring old salad. It’s filling, flavourful, nourishing, interesting, sweet, savoury, tangy and just really, really delicious. So delicious in fact, you’ll be thinking about it long after you take your last bite and wondering when you can get yourself another bowl full. It’s quite easy to make and doesn’t take long if you prepare it in this order: put some water on to boil. Chop up the sweet potato and cauliflower and get them in the oven. Once the water boils, pour it over the sliced onions in a bowl. Let that sit for 10 minutes. 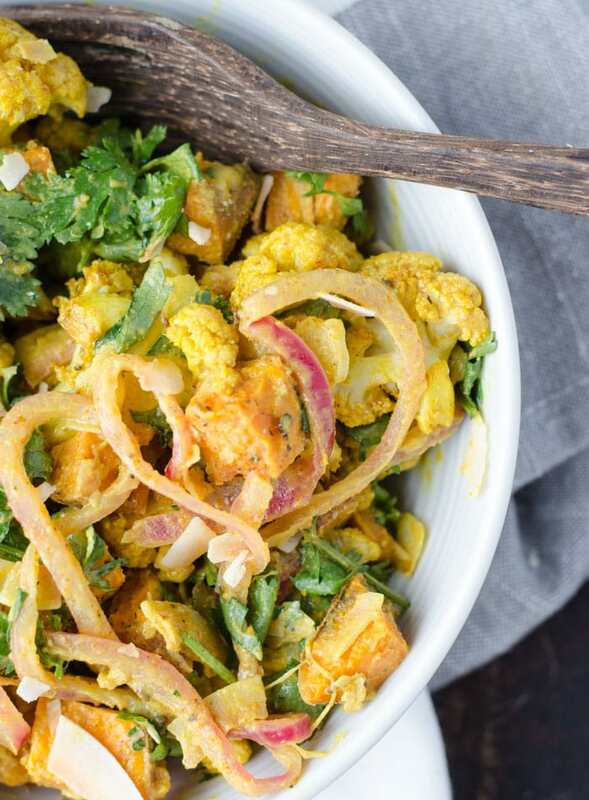 While the cauliflower and sweet potato are baking, make the dressing, add the cilantro and coconut to a large bowl and finish making the pickled onions. 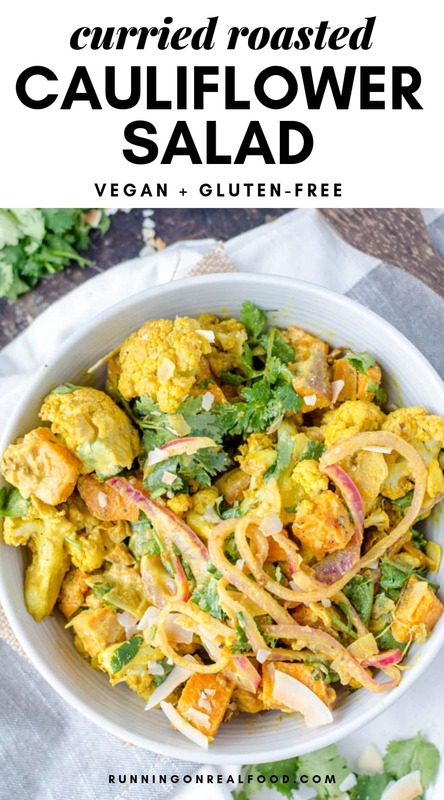 Once the roasted veggies are done, add them to the bowl with the cilantro and coconut, mix in some picked onions, top it off with the curry dressing, mix well and dig in. There are a couple of steps to making this beautiful salad but the reward is well worth the effort. 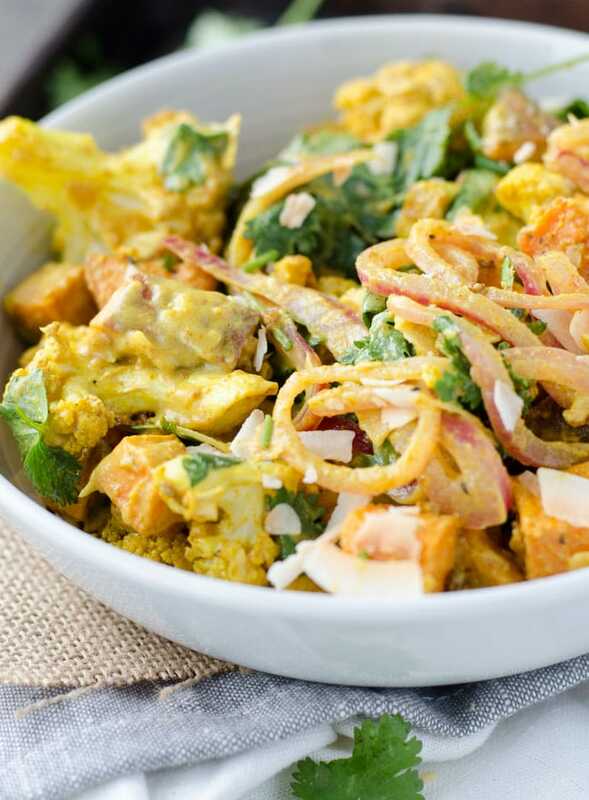 It’s sweet and tangy with curried coconut flavours and thanks to wholesome ingredients like cauliflower, sweet potato and onions, it’s highly nutritious, filing and satisfying. This recipe makes 4 sides or 3 meal-sized servings. Nutritional information is for if you make it into 3 large servings. Toss the cauliflower in the curry powder, salt and oil. Spread on a single layer on a foil, parchment or silicone mat-lined baking sheet and bake for 30-40 minutes, shaking the pan half way though, until starting to brown. Toss the cubed sweet potato with the oil, salt and pepper. 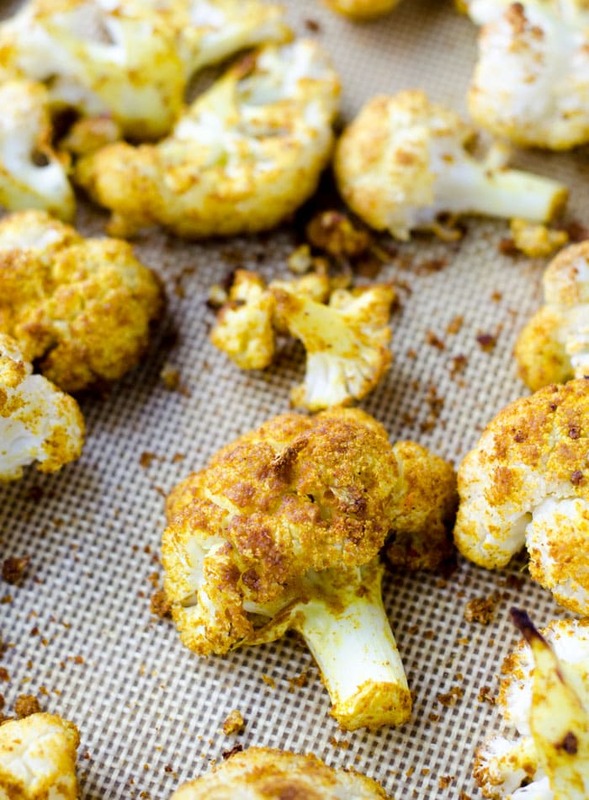 Place in a single layer on a parchment paper or silicone mat-lined baking sheet, add to the oven with the cauliflower and bake for 30-40 minutes or until fork tender. Add all ingredients to a blender or use an immersion blender and mix until smooth and creamy. Add the coconut, cilantro and pickled onions to large bowl. When the cauliflower and sweet potato are done, add them to the bowl. Add desired amount of dressing and mix well to combine. Add 1/3 cup of vinegar, 1 tsp sugar, 1 tsp salt to a mason jar. Haha, it’s an issue for sure. Especially with curried roasted cauliflower! 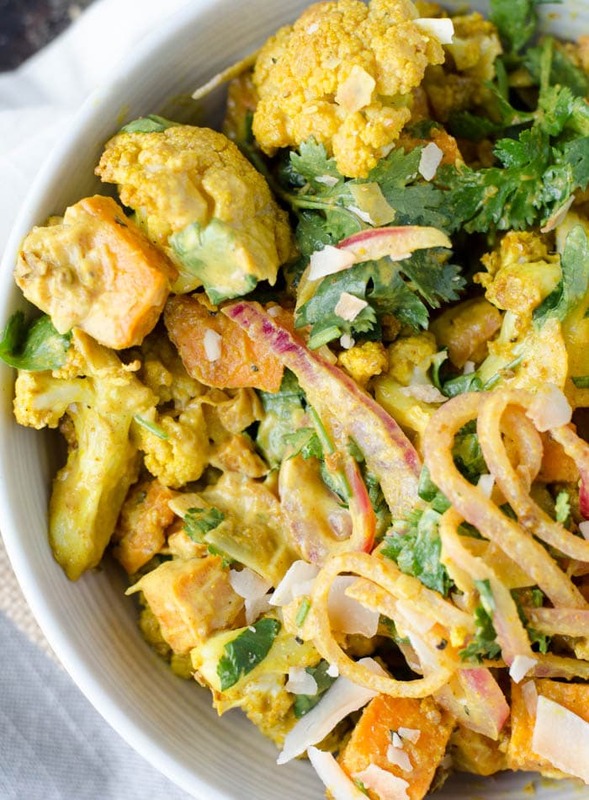 I LOVE curried cauliflower! Possibly one of my favorite ways to enjoy it. Also pickled onions!? Love those too. This combo sounds delish. 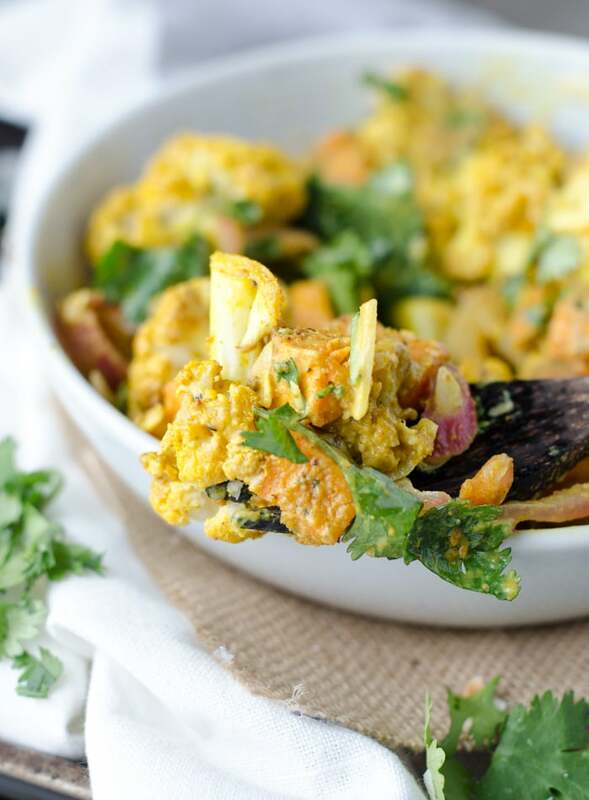 I love curried cauliflower so this salad is right up my alley! The dressing sounds so delicious and creamy! My husband was just telling me he wanted me to make more curry based dishes- this sounds like the perfect option for us! I love the flavor combo here! It’s a good one!! Hope you guys enjoy it! 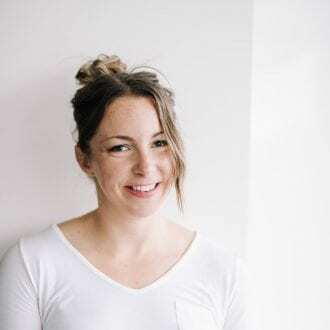 Deryn this recipe looks awesome! And I forgot to tell you — I just got your recipe in my Stridebox! Woot! Cool! Ya, they asked if they could use it, I totally forgot! I made something similar and add turmeric too! So good! 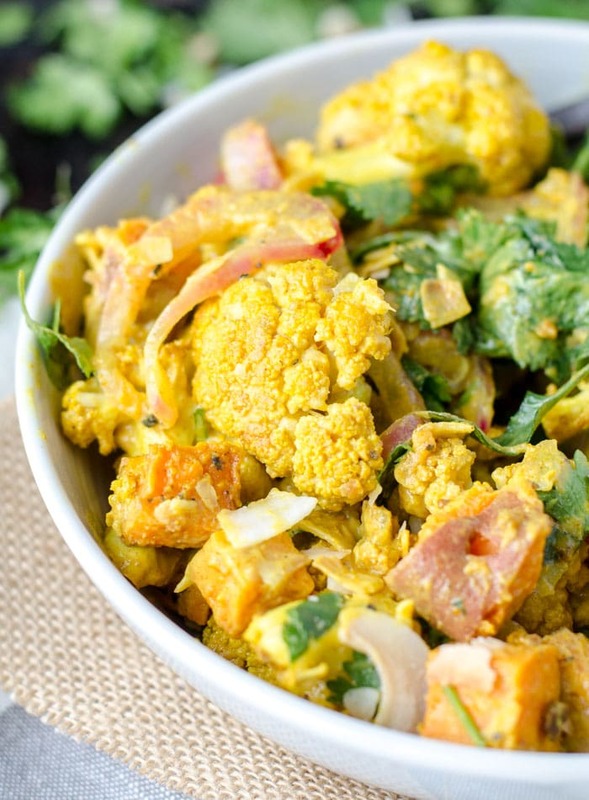 This looks so good, you had me at roasted cauliflower and that bright beautiful curry color! I love that you sweetened the dressing with dates – I haven’t tried dates and curry together, but they sound like a perfect match. Dates have been my go-to dressing sweetener lately, I love that they add fibre, minerals and vitamins! Plus they go with pretty much everything. Ok so I made this last night and I didn’t have any tofu on hand so I used chickpeas instead and just blended them really well. It was AMAZING! Seriously this dish will be in rotation in our household. It was delish! So happy to hear that!! Interesting to try the dressing with chickpeas! Glad you enjoyed it. Yay! Enjoy. You can always use a few drops of stevia in place of the dates. This roasted cauliflower salad looks so delicious! I’m definitely trying it tomorrow. Thank you! Awesome. I hope you enjoy it!! Let me know! Was very excited to make this salad but I am so underwhelmed. Not enjoying it at all. It’s needs a more creamy texture or something, think if I used yogurt instead of tofu it would be better. I went out on a limb making this and it disappoint! My 11 year old son even loves it! It was easy to make and I’m playing around with different variations tonget readybfoe the holidays. Thanks for such an awesome recipe. I look forward to exploring more and adding to our collection of delicious healthy food. Happy Thanksgiving! !